Brown Sugar is made by the simple addition of molasses to granulated white sugar. The addition adds complexity flavor and heightened taste to sauces, marinades, baked goods and drinks. Brown Sugar appears in three primary forms, Light Brown Sugar, Dark Brown Sugar and Sugar in the Raw. Each of these individual formats is noted by their degrees of flavor intensity over the standard white sugar format. Dark Brown Sugar has twice the intensity level and compliment of molasses over Light Brown Sugar. For our Brown Sugar Barbecue Sauce we'll be focusing on the intensity of flavors and thus the Dark Brown Sugar version is preferred for our recipe. 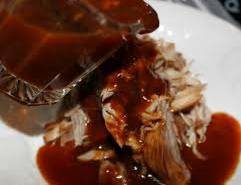 We'll be creating a barbecue sauce that bastes in an addictive brown sugar glaze suitable for ribs, chicken, and steaks. Brown Sugar Barbecue Sauce delivers flavors of Texas, Memphis and Southern Style barbecue subtle and bold all at the same time. Blend the ingredients together until even. Transfer the ingredients to a cooking pot and heat bringing the ingredients to a boil. Turn down the heat to simmer and stir for 10 minutes. After the simmer stage remove the ingredients from the heat and let rest at least 1 hour. If you can allow the ingredients to rest overnight that would be preferred. In the biz we call this the maturation process. Allow the ingredients time to mature and meld the flavors before use. Once the ingredients have melded you can heat on low for 5 minutes then baste on meats either before or after the grilling process. Note, the richness and complexity of the flavors after the maturation process. Also note how evenly the sauce spreads on meats. If you desire a slight burst of heat you can add a 1/4 teaspoon of Cayenne Chili powder during the blending and cooking process.